Travelling at an impressive 300km/hr, a high-speed railway train took 5 hours and a half to reach Shanghai from Beijing. The voyage was impeccably comfortable. The train station was huge and amazing. 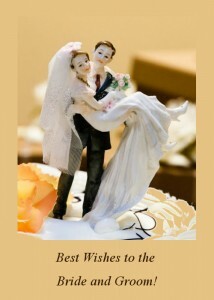 Yet the actual surprise was the sheer difference between Beijing and Shanghai. Traffic in Beijing was crazy but we had hardly left Shanghai’s train station when we were already blocked behind a long queue of cars. This is no wonder if one considers that about 24 million people live in this city. Recent modernization and progress in Shanghai have attracted many persons and in the last five years, the population tripled itself. Along the road, we observed that plain residential high rises were wide to an extreme. Besides them, luxurious or commercial high rises glistened beautifully as if in a bid to outshine the sun itself. 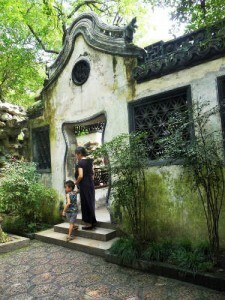 Older traditional structures, together with buildings which formed part of the foreign concession areas, claimed the passers-by attention with their distinguished architecture. Originally, a simple fishing village, Shanghai’s economy expanded rapidly once it was turned into a commercial port. Since at the time, traders could only use the sea or waterways as a means of transportation, Shanghai’s wide harbour began to attract numerous Chinese from various parts of China and also several foreigners. A society of immigrants started to flourish, each of which began to leave their influences in this new city. In a few years, a large flat muddy area, overgrown with reeds, which was situated on the north bank of Huangpu River, was turned into a zone for foreigners and they named it the Bund. Starting from just a one-sided street, running in north-south direction, the location soon flourished with commercial buildings which increased further the significance and the economy of Shanghai. Yet in the mid-19th century, serious conflicts arose between the forces of Western countries and the Chinese, Qing dynasty, after China attempted to suppress the opium trade. Since the 18th century, foreign traders, particularly the British, had been illegally exporting opium which they imported from India. By the 19th century, this trade had grown dramatically, and the resulting widespread addiction in China began to cause serious social and economic disruption. Two Opium Wars broke out in which China was twice defeated and foreign concessions were established. It was in 1943, during the war between China and Japan, that the foreigners decided to abandon Shanghai. Between the 1950s and the 1960s, some of the elder people who resided in Shanghai, proposed to the government to demolish these colonial buildings which reminded them of a bitter past. However eventually, it was decided to retain these structures since they represented a real part of the city’s history, even if painful. 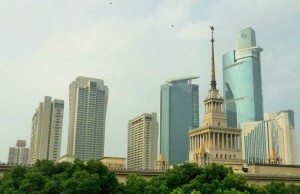 In the last 100 years, the Bund frontage buildings were repaired and reconstructed several times. 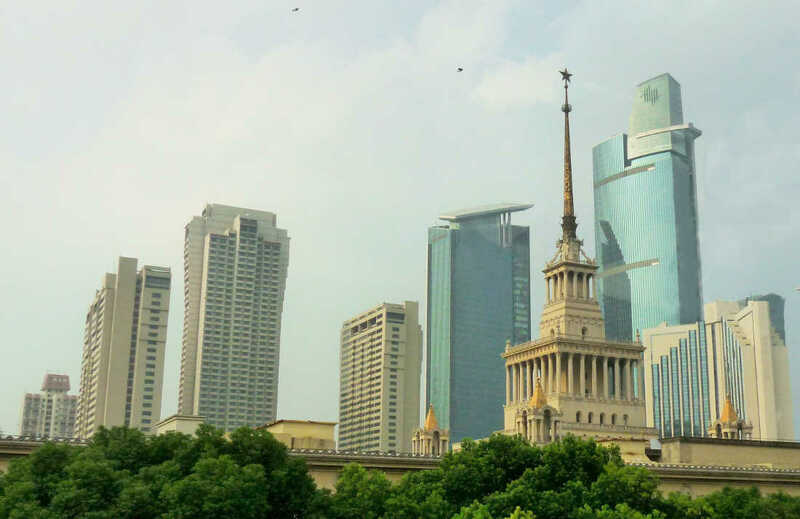 Today, this area is embellished with prominent and elegant structures which contrast deeply with the opposite side of the Bund wherein some daring and bizarre high rises have been built. At night, the latter, turns into a spectacular wonderland as the colossal structures are fully illuminated in bright and colourful lights. A visit to this district which looks like a strange combination of London and New York, will reveal why it has become the symbol of Shanghai and the pride of many of its residents. 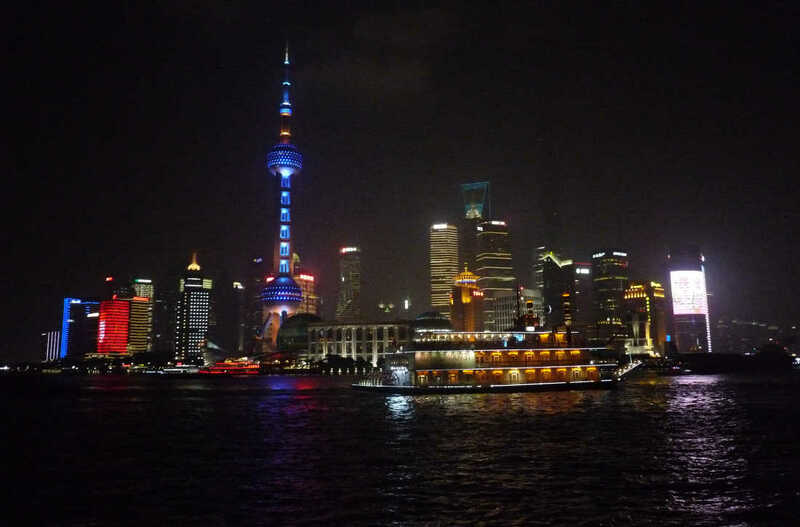 Crowds of visitors gather daily at the Bund in order to enjoy the beautiful scenery on the Huangpu River which divides the old and the modern zones. 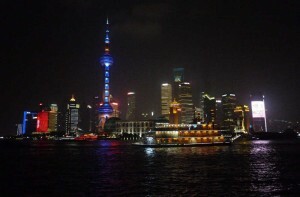 Nonetheless, if one wants to enjoy the experience to the full, a night boat cruise is certainly recommended. Our guide from Shanghai explained to us that this city has changed tremendously in these last years. In 1987, there were only 12 high rise buildings in Shanghai, whereas today, there are around 140,000. People have more money in their pockets, education facilities have increased, and life is more comfortable especially due to the efficient and far-reaching subway system. Yet he felt that simultaneously, Shanghai citizens were losing some important characteristics of the city. Indeed, when elders returned to the city after living far away, they could not find their way around as a number of the old landmarks have gone or are engulfed amongst the different modern landscape. The repercussions of the sudden modernization of Shanghai have always been the focus of the authorities which are trying their very best to mitigate the impact of such changes. 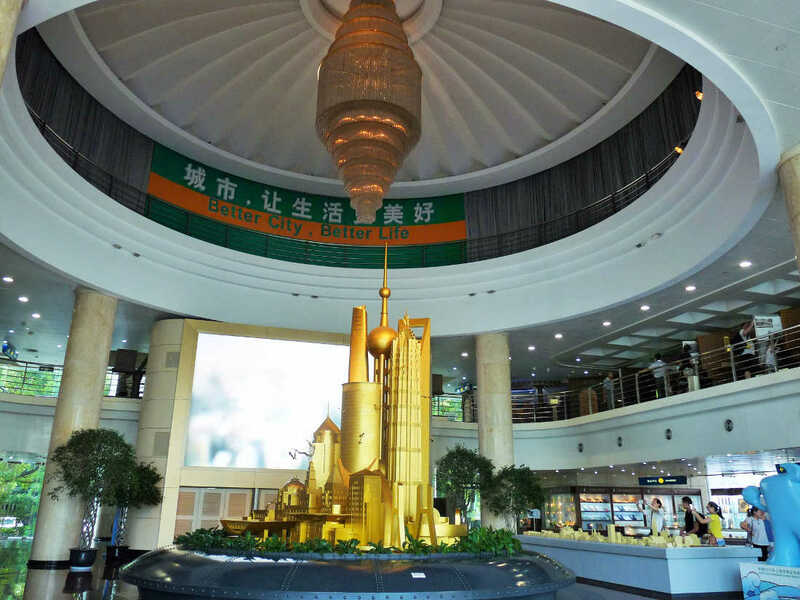 Their plans and projects are comprehensively described in the vast exhibitions which are displayed at the Shanghai Urban Planning Exhibition Hall which is located at the People’s Square. The centrepiece of the exhibition is a huge scale model of the city which shows all the existing and approved buildings. Moreover, a circular screen provides visitors with the opportunity to enjoy a fascinating 3D virtual tour around the city of Shanghai. Photo presentations explain how old buildings which were worth preserving and conserving, were carefully selected and restored, and then given a function in order to revive them. A particular example is the M50 contemporary art district which up to a few years ago was a disused industrial space. Another is the pedestrian walkway of Nanjing Road wherein 100 year old shops were amalgamated with new structures from where now, one can find speciality products of different trades standing next to famous brands. In Shanghai Old Street, which was reconstructed according to traditional Chinese style, visitors can roam around Yuyuan Market and absorb the allure of earlier times, whereas the nearby Yuyuan Gardens provide the beauty and serenity of a green environment. 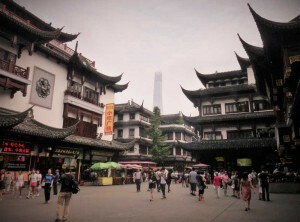 In the outskirts of Shanghai, ancient towns, such as Zhujiajiao, represent life of a distant and far simpler period in Shanghai. Concentrated under Shanghai’s Expo2010 motto ‘Better City, Better Life’, the main message of this place is to urge people to be proud as well as protective of their new city. A delightful wider look at the landscape of the city of Shanghai can be appreciated at a choice of revolving restaurants which are available on high towers. Definitely a surreal experience which gives you the ultimate impression of being on a totally different planet.